Gartner has just released a report on mobile device sales for 2010, and unsurprisingly smartphone sales to end users were up 72.1 percent from 2009 and accounted for 19 percent of total mobile communications device sales in 2010. In terms of the fourth quarter, smartphones accounted for 22.2 percent of the quarter’s 452 million sales in mobile devices. Worldwide mobile device sales to end users totaled 1.6 billion units in 2010, a 31.8 percent increase from 2009. The increase in smartphone sales helped push Apple and Research In Motion up in the ranking of global mobile device manufacturers to the No. 5 and No. 4 positions, respectively, displacing Sony Ericsson and Motorola. In Western Europe and North America accounted for 52.3 percent of global smartphone sales in the fourth quarter of 2010, with smartphones accounting for close to half of all handsets sold in these regions. Apple sold 46.6 million units in 2010, which marks an 87.2 percent growth from 2009. Gartner attributes this increase to international expansion and the end of exclusivity deals. RIM’s overall mobile phone sales to end users in 2010 reached a total of 47.5 million units, an increase of 38.2 percent year-on-year, buoyed by strong sales in Southeast Asia, the U.K. and the Netherlands. Additionally RIM saw its market share decline from 19.5 percent in the fourth quarter of 2009 to 13.7 percent in the fourth quarter of 2010. 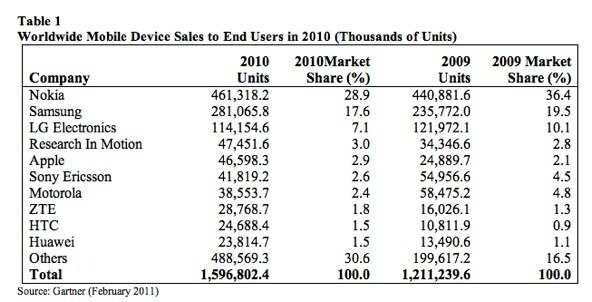 Nokia also didn’t fare well in 2010 according to Gartner’s report. In 2010, Nokia’s annual mobile phone sales to end users reached 461.3 million units, a 7.5 percent drop in market share from 2009. And Nokia’s share of the smartphone market dropped 6.7 percentage points from 2009. In terms of sales by smartphone operating system (as opposed to manufacturer), Android grew 888.8 percent in 2010 and moved to the No. 2 position behind Symbian, whose market share dropped further in the fourth quarter of 2010 to 32.6 percent or 32.6 million units. Apple’s iOS took the No. 4 position in 2010, selling 46.5 million units in the year.